Did you ever start a project that you thought would take a certain amount of time and it ends up taking ten times longer! Well, that’s how my powder room makeover went. This has to be the smallest room makeover in the history of makeovers! It’s just a teeny, tiny powder room! But, small doesn’t always equal easy or quick! I wanted to make this tiny room special, memorable, and pretty. So, when Wallpaper Direct contacted me to work with them, I was beyond excited to pick out a wallpaper for this small space. 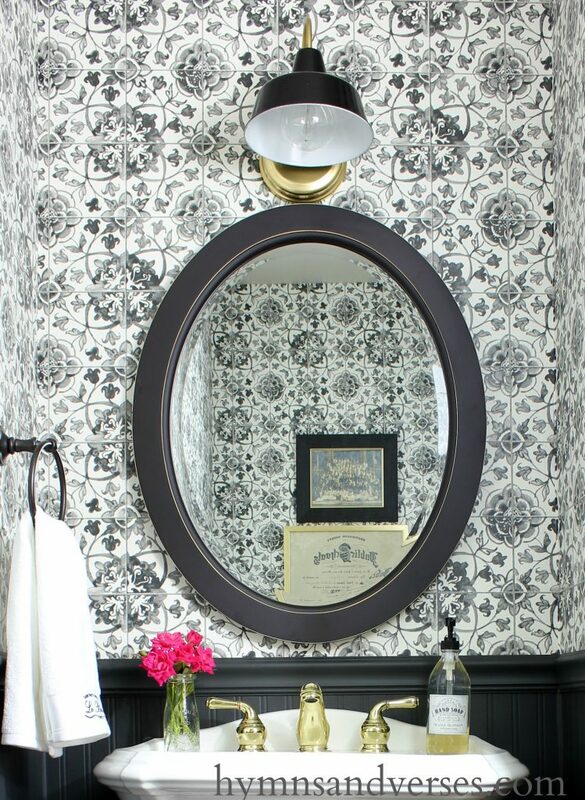 As soon as I laid eyes on this black and white tile wallpaper on the Wallpaper Direct website, I knew it was THE ONE! Isn’t it just amazing! It’s bold, yet classic. It has the look of the cement floor tiles that are so popular now! My initial plan was to use this tile wallpaper floor to ceiling. But, once I started, I soon found out that this graphic design had to be perfect and that’s hard when your walls aren’t framed perfectly. So, I decided to keep it on the upper half of the wall with a beadboard and chair rail on the lower half of the wall. But, let’s start at the beginning. The first thing we did in this room was totally empty it out. There was your standard, builder grade sink and cabinet and an almond colored toilet. I wanted a white pedestal porcelain sink and white toilet. I thought the pedestal sink would do a great deal to make this tiny space feel a little bit more open. I began looking at the big box stores and then decided to check out Craigslist. Boy, am I glad I did! I found this matching Kohler Portrait pedestal sink and toilet from a contractor ,who had just finished a bathroom makeover for a client and this beautiful set was what was removed!!! I paid $125 for this set, with the American Standard Williamsburg polished brass sink faucet. The beadboard is actually wallpaper as well. I picked it up from Lowe’s. Once painted, you would never know it’s not the real deal! And, its so much easier to put up. Hubs was a dear and cut out all those intricate mitered corners and breaks for outlets. I painted the beadboard wallpaper, chair rail, and baseboard molding in Benjamin Moore Nightfall in matte finish. 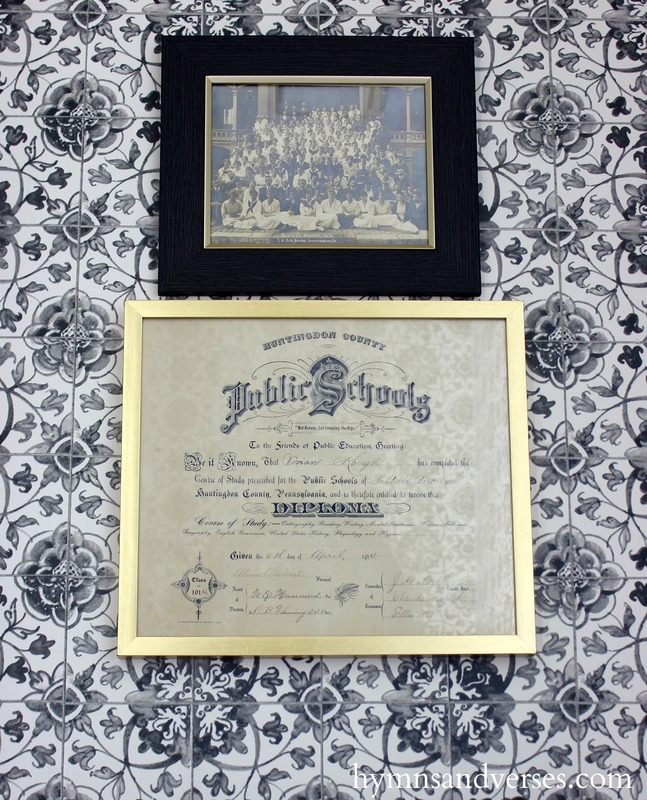 For artwork, I had my grandmother’s 1914 high school diploma framed in a simple gold frame. The photo above is a group photo of the Shippensburg University summer school class of 1915 with my grandmother in her white sailor style dress in the second row. The light fixture is a $30 galvanized outdoor fixture from Lowe’s that got a little spray paint treatment with metallic gold, glass black, and gloss white! I picked up the oversized, round Edison bulb at HomeGoods for $3.99! The black oval mirror is from allen + roth at Lowe’s. 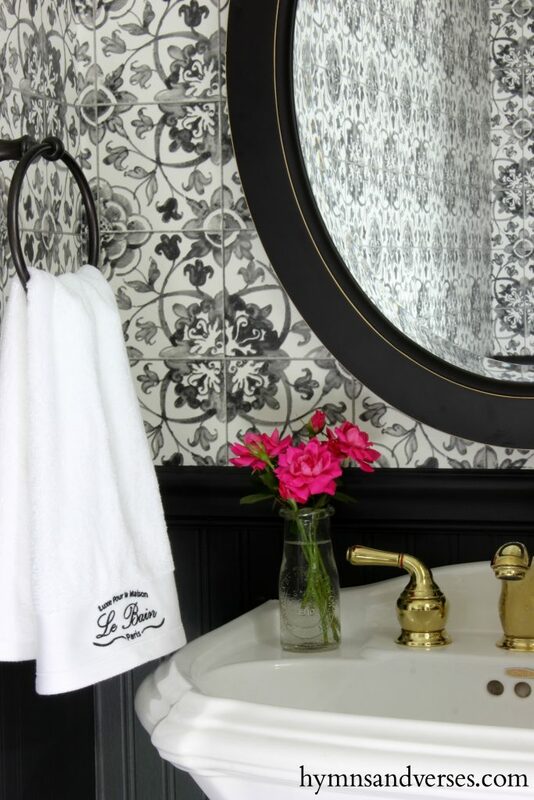 The pretty “Le Bain” hand towel is from HomeGoods. And, it’s always nice to have some fresh flowers in a powder room, so I clipped some bright pink roses from my Knockout rose bush. They are about the only thing left blooming at my house!! 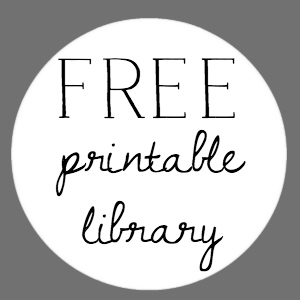 I’ve included a full source list below with product links. 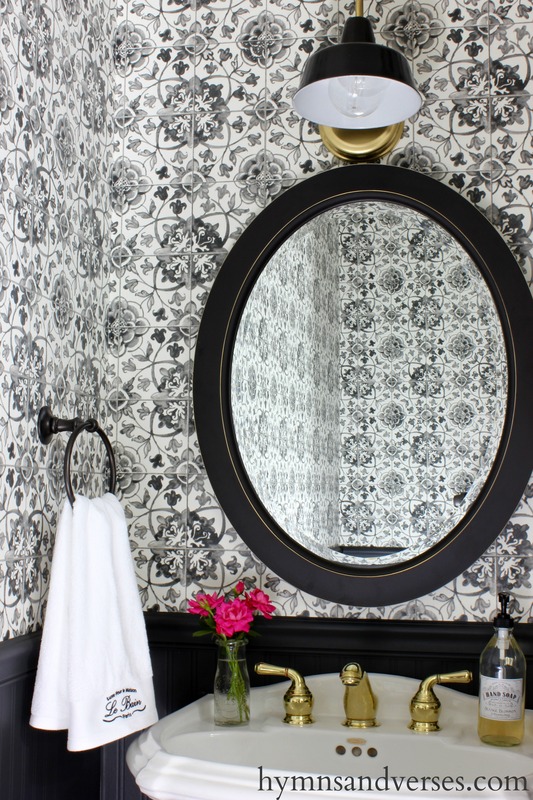 I would love to hear what you think of my powder room makeover and, specifically, your thoughts on the black and white tile wallpaper! Gorgeous! Classic, yet very on trend. I love the black beadboard – it really sets off the gold trim! This powder room pops! I love the use of textures and neutrals. It’s really pretty! Gorgeous! Love everything about it. The wallpaper is fabulous. Gorgeous. Love the black and white and the tile pattern is perfect. Wow – this looks amazing! 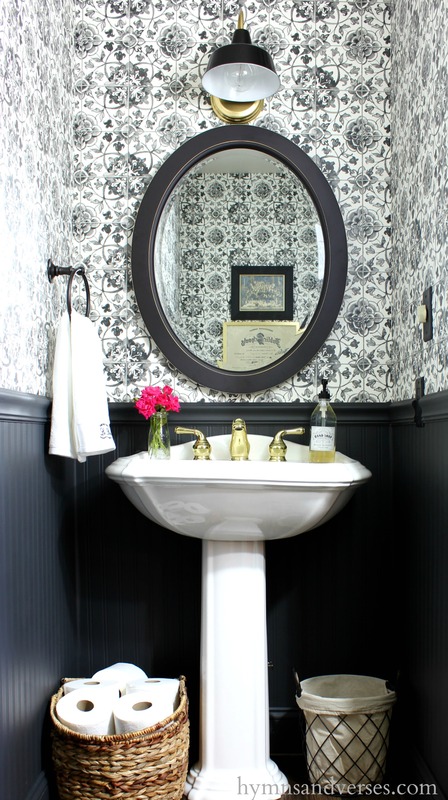 I have the same tiny powder room and have been undecided as to how to redo it, but after seeing yours I now have some direction because I just love the look of the dark beadboard with wallpaper above. Thanks, Dee! I finally found a large scale – for 25!!! This is so pretty! I have a powder room that is smaller if you can imagine. I painted my ceiling black. I love the colors. It is so classic yet on trend. I can’t believe the walls are papered. They look like tile and wood. Great job! Fabulous job! I love everything! All the little details are beautiful. the time you spent on this project is all worth it. BEAUTIFUL! This teeny, tiny powder room looks fabulous, dear friend! I love the Timeless Classic lines you’ve chosen in your sink and toilet. Thank you for allowing us to see your newest project completed. P.S. When “Mr. Ed” and I begin a new project, we lay out a “time~line”. All I can say is WOW! This small room looks so grand and you didn’t miss a detail. LOVE the sink and toilet, what a steal on Craig’s list. You couldn’t get one piece new for that cost. Great job!!! Thanks so much! Regarding the sink and toilet find, I really couldn’t believe it either. When I was writing the post, I looked up the cost of the sink and toilet and together they would be over $1500!!! And, they are like brand new. The contractor said he kept them because they were so nice and he knew that someone could use them!!! I’m so happy he did! Hurray for Craigslist! I’m in a good area to get good things for free, even! What a find for you. I’ve enjoyed finding posts from you through Pinterest. I’ve wondered how realistic that beadboard wallpaper is, and your photos answer that question. You’d never know (without touching it) that it isn’t the real thing! I love your makeover, and your attention to detail. It isn’t easy to pull off black in a small space, but you’ve done it well. Thanks, Ginny. The beadboard paper is awesome. It was a way that I could do it myself without having to involve the hubs in another project, ha, ha! And, it does look like the real deal! I love it all! I’ve paid particular attention to your painted breadboard wallpaper since I have had some in my closet for five years now, but that patterned one looks just like expensive tiles. Pinned. Thanks, Bliss!!! The paper even has the texture of tile. It’s amazing! Thanks for the pin! Hope you had an awesome summer!!! What do I think?? It’s absolutely gorgeous ? You will love it for a long time! Doreen that is simply stunning! I LOVE that paper. Fabulous job! I would love this in my home! Doreen, I The most projects take at least three times as long as I think they will! Love your use of baskets. Great idea for place to store toilet paper…handy too…right there where you need it. All in all pretty and practical. I like it! The powder room looks great, does the tile wall paper come in other colors? Hi, Claudette! Yes, the tile wallpaper comes in a few other colors. I know one was blue and white. Follow the link in my blog post to wallpaper direct Faro Tile by Albany, and you can see all the colors they have available! It’s really a wonderful wallpaper that even has the texture of tile. You know how I said I’d never ever have wallpaper?!!! I absolutely love all you’ve done! I wallpapered soooo much in the 1970’s into the 1990’s and oh yes a border in 2001 for my then Jr high daughter that was the next to the hardest thing to ever come down!!! I said never again. Bbbbbbut…..this looks so awesome!!!! I’m tempted. Really tempted!!!! Beautiful job. I love, love, love the tile wallpaper!!! Love the black and white combo. Timeless and classic. You really have an eye for detail. Always love your posts and look forward to them. Enjoy your holiday weekend! paint over the wall paper??????? Please explain. HI, Cheri. The beadboard wallpaper comes in white. So, I hung it and then painted it. I would recommend painting, even if you are keeping it white. It gives it a more finished look. This is inspiring- and educational! Who knew beadboard wallpaper was even a thing? Thanks for getting my wheels turning about what to do with my small bathroom! The beadboard wallpaper is the best! It comes in white, but looks more finished if it is painted after hanging – even if just painting it white. You have an amazing God-given talent to be creative!!! I would never have chosen such a busy design for a small room, but that shows I lack a lot on the creativity scale. 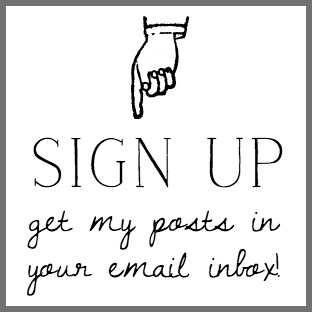 I’m new to your blog but love everything about it. Hi, Jan! Thanks so much for your sweet comments on my powder room! Like I said, this was out of my comfort zone, but I’m in love with how it all came together! Sometimes stretching is good in all areas of our life! So glad to have you following along!! Wow….love your choices. It’s beautiful! 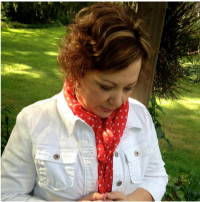 This is absolutely gorgeous, Doreen! I love the top and bottom wallpaper- it seriously looks like the real deal! And wow, talk about scoring on Craigslist- nice job!!! Loving everything about your new powder room!!? I have to admit I would have been on the fence about this look but your power room is stunning. I’m a fan! Incredible! I totally love the whole thing. Excellent job!! !